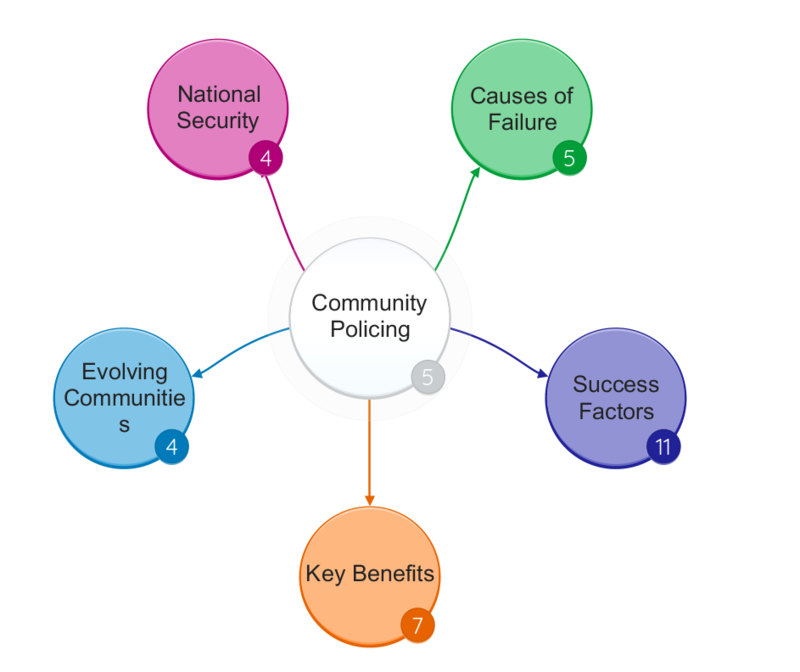 Community Policing Effectiveness – understanding the benefits and key success factors necessary for successful community policing in the 21st century. As communities evolve through globalisation, immigration, gentrification, secularisation (Wolffe, 2007), individualism and other trends, new crime patterns are emerging, driven and enabled by profound technological (Goodman, 2015) and sociological change (Sandbrook, 2006, pp.308-347). Protecting communities from traditional and emergent threats presents challenges. There are frictions between communities and authorities, including the extended police and criminal justice family. Some communities are settled, others dynamic, fluid and transient, with vulnerabilities arising through weak integration and imperfect social cohesion. Tensions exist within and between communities, giving rise to both crime and the fear of crime. In response, particularly in the wake of Lord Scarman’s (1982) report into the Brixton Riots and Sir William Macpherson’s (1999) report into the death of Stephen Lawrence, police culture, recruitment and community relations (Hall, Grieve and Savage, 2009, pp. 124-143) have been scrutinised. Changes to operational policing methods (such as ending unit beat policing) coincided with extensive social upheaval in Britain. Measures aimed at creating policing efficiencies inadvertently led to reactive policing and distancing of police officers from sections of the public (Rowe, 2013, pp. 101-102). With attenuating support, particularly within Black and Minority Ethnic (BME) and socially deprived demographics, community policing has been promoted as a key strategy in establishing trust, acceptance and police legitimacy (Ibid, p. 98). As the national security threat has evolved, the importance of community policing in counter-terrorism response has been further elevated (Blake et al., 2012, pp. 146-150). Complex factors (domestic and geopolitical) give rise to radicalisation susceptibility across an ideological spectrum of far-left, far-right, single issue, nationalist and religious thought. Isolated cases if not interdicted may progress to terrorism or support of terrorism. 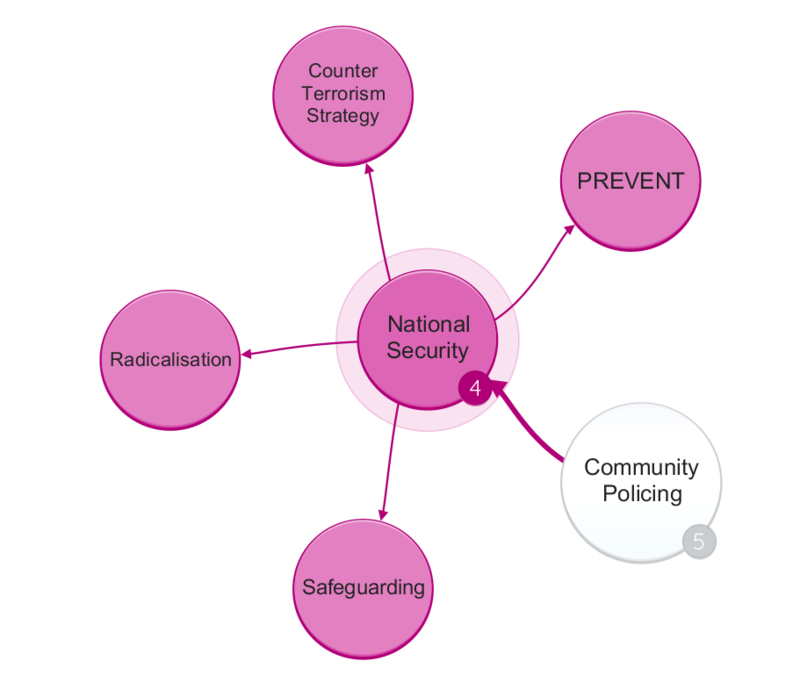 Community policing plays an important role in the UK’s counter-terrorism CONTEST strategy (HM Government, 2011) and in the work of its counter radicalisation sub-strands PREVENT and Channel (HM Government, 2015). 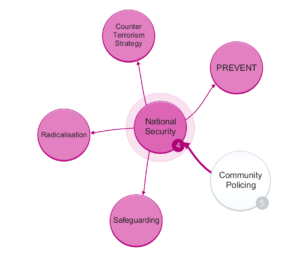 In working with communities to identify radicalisation threats and individuals susceptible to extremist ideology, community policing plays a role in safeguarding and capacity building as well as developing criminal and terrorist intelligence (Innes, 2006, p. 3). In understanding the efficacy of community policing, in reducing crime and interdicting terrorist threats (at various stages of their evolution) it is important to examine the operational scope and associated expectations of policing initiatives. 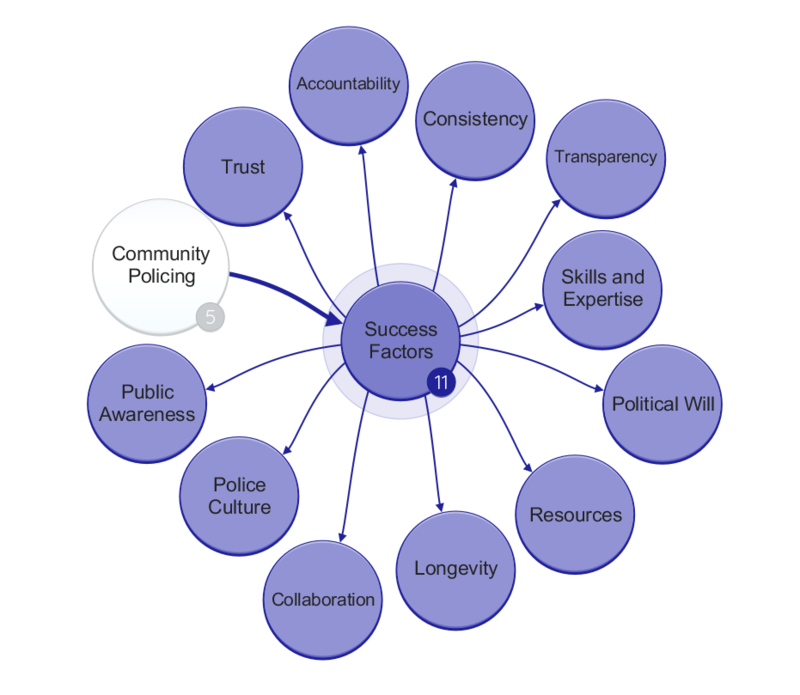 It is next important to question under which conditions community policing is most likely to succeed and why. This encompasses political will, maturity of government, transparency and accountability, duration and commitment of programmes, trust building and delivery, collaborative problem solving, funding and availability of skills and expertise (Rowe, 2013, p. 103). As a nuanced and complex endeavour, key challenges and risks associated with community policing must be enumerated to develop a rich understanding of its potential and sensitivity. Particular sensitivities appertain to counter-terrorism and these may be juxtaposed and contrasted with other aspects of crime prevention. Qualitative and quantitative measures can be contextualised and examined to ascertain the efficacy of community policing, critically questioning shortfalls. Community policing studies in UK and US contexts have been here examined, seeking lessons for maximisation of benefits in its implementation. In unpacking the meaning and scope of community policing, it is perhaps first helpful to conceptualise its operating context as that of a ‘problem solving environment’ in which multiple actors collaborate to address mutual concerns (taken here as crime reduction and improving community safety and security) (Neyroud and Beckley, 2008, p. 31). In its broadest sense community policing aims to develop and improve relationships and address visible and surface hidden concerns (Fielding, 2005). Community cannot be understood as an homogenous entity. 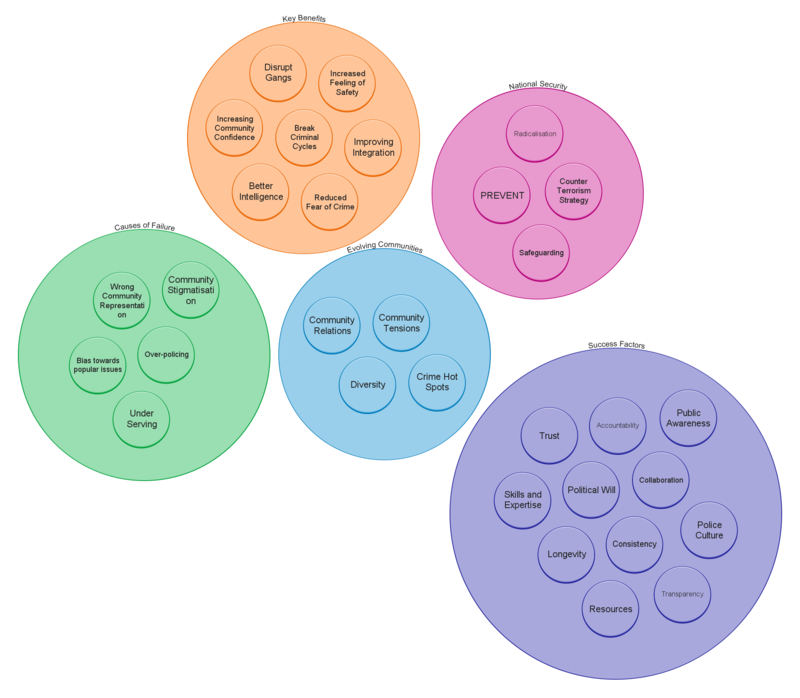 Modern developed societies comprise communities of communities, within which are high levels of cultural, ethnic, socio-economic and religious diversity (Klockars, 2005). Identifying credible representative stakeholders, developing trust and engagement within a multi-layered society is non-trivial. The efficacy of community policing appears to hinge on commitment to a long-term strategic vision, scalability and sustainability, doctrinal acceptance within police culture (Murray, 2005, p. 2) and (Williams, 2003, pp. 122-123), police facilitation of community led problem solving (Skogan and Hartnett, 2000, p. 110) with accountability, transparency and honesty in managing stakeholder expectations. One must critically question to what degree communities should be made responsible for their own safety and security. On one hand to deny this responsibility (or opportunity) is disempowering, while on the other, the risk of collectivising guilt must be considered if crime or terrorism persists or pervades. Effective community policing requires a civic society open to collaboration and collective problem solving. This implies mature and robust government and accountable public institutions, independently held to account through a free press and judiciary (Parsons, 2017, p. 4). Institutional corruption, discrimination or bias in any public body is injurious to community policing as it pollutes the relationships so essential to make the problem solving environment viable. Community policing schemes established as a tactical response, or operating within repressive environments must therefore be treated with scepticism. Indeed, community policing can be misappropriated, expediently applied as a metaphorical band aid, or spun as a fashionable cause du jour. The positive impact such initiatives have on crime and community safety and security is likely negligible or accidental. This complicates analysis of community policing, as schemes may have little chance of succeeding due to factors outside their locus of control or through fundamental mistakes in approach and configuration. 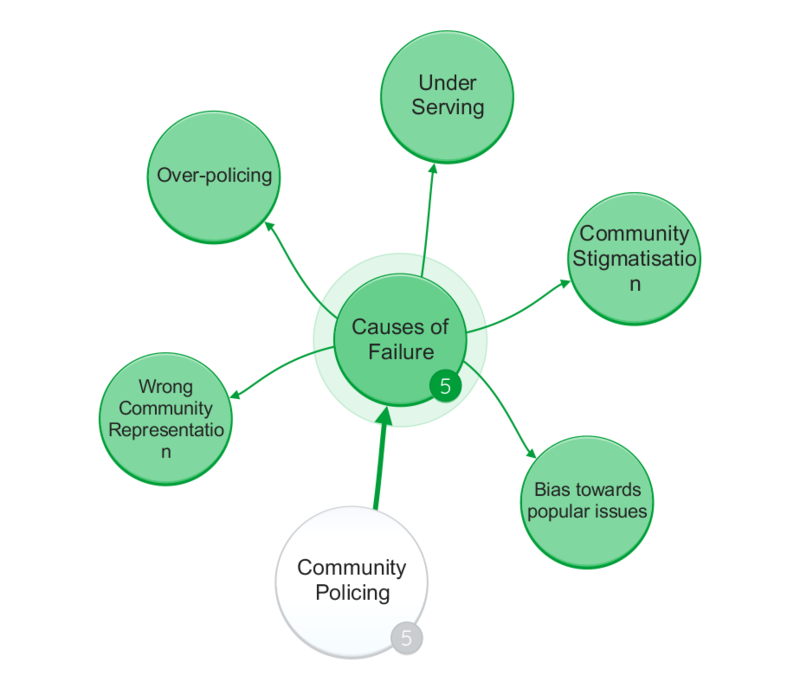 Crime figures can be quantitative analysed, but proving a causative link to success or failure of community policing is complex. It could be argued that a rise in reported crime is an indicator of improving trust in policing and criminal justice. Fear of crime and perceptions of safety are less tangible, but community safety measures (and other analogues) could include ‘feelings of safety’ as analysed through the British Crime Survey (Office for National Statistics, 2017) as well as public satisfaction surveys with police performance (Tuffin, Morris and Poole, 2007, pp. 49-53). Representation and protection of marginalised groups, safeguarding women, children, the elderly, disabled and mentally ill are important in this context (Trojanowicz and Bucqueroux, 1994, pp. 79-82). Community policing also has a key role in the interdiction of violent extremism and radicalisation leading to terrorism. It is therefore important that policing develops sophisticated religious and cultural understanding, free of orientalist bias and stereotype. In helping construct and maximise the utility of the problem solving environment described, community policing plays a central role in building capacity and resilience between police and public (Organization for Security and Co-operation in Europe, 2014, pp. 63-65). Community Safety Partnerships and engagement forums such as the Muslim Contact Unit in the Metropolitan Police have been successful. Police Community Support Officers and Police Special Constables arguably bolster policing capacity (although this must be considered in light of austerity and front line policing cuts), providing engagement opportunities for civic minded individuals (Sutherland, 2014). 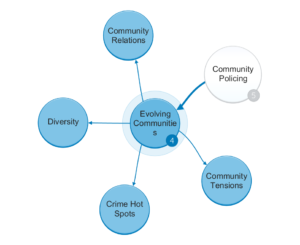 This opens additional channels for expanding police diversity and community contact, although it has been noted that community police officers are not always resident in their assigned areas. They may also be moved to different operational commands, creating continuity problems if there is insufficient succession planning. The litmus test for community policing is the resilience of relationships it builds between stakeholders. The strength of these bonds may be tested when communities are attacked or pilloried or the police fail in their public or ethical responsibilities. Stop and search, death in custody or a safeguarding failure in the protection of the vulnerable (from sexual predators or radicalising elements) may lead to significant community anger. Creating a safe space where community grievances can be voiced and addressed is a critical contribution. There are a multiplicity of challenges and risks associated with community policing. A poor choice of community representation may lead to credibility issues, or the perceived endorsement of a nefarious group or individual. Over-policing or under-serving a community may negate the potential of community policing, tying up its activities in the alleviation of community grievance, rather than proactive interdiction of crime and public nuisance. Expediency and political sophistry damage trust. Police and other agencies may have a predilection for working with friendly and unchallenging partners, reflecting “existing social order” (Mackenzie and Henry, 2009, p. 27). Tackling comfort zones and echo chambers is important to ensure false optimism does not pervade. Community tensions could be elevated if there is a perception of ‘softness’, ‘pandering’ or a lack of moral courage to tackle difficult cultural and normative issues such a gender or sexual equality and safeguarding (Jay, 2014). Community stigmatisation is a further risk (Mackenzie and Henry, 2009, p. 39). Over policing may make people feel unsafe or subject to the panoptic gaze of state authority. Sharing crime and problem statistics with communities may negatively impact their sense of security and safety (Alderson, 1979, p. 191), particularly where actual crime rates are higher than community perception. There may be a temptation to focus problem solving efforts on popular issues, rather on than those where police can deliver maximally effective outcomes (Independent Police Commission, 2013, p. 75). This may improve perceptions of the police, but have little meaningful impact on crime statistics. Community policing can therefore usefully build relationships and trust, assist with community integration, facilitate criminal and terrorist intelligence elicitation and distribution, identify and isolate ‘bad actors’. A visible and reassuring presence, listening to community concerns and developing meaningful joint initiatives is a significant contributor to the alleviation of the fear of crime and satisfaction with policing. Tackling signal crimes and developing healthy environments contributes to community vibrancy and creates a cold house for criminals (Wilson and Kelling, 1982). Early intervention, such as youth programmes and gang programmes may interrupt burgeoning criminal careers, or steer the vulnerable out of the path of radicalisers. The cost of non-intervention is likely immeasurable. The true value proposition of community policing is therefore difficult to fully qualify. It is not a panacea in terms of actual crime reduction. It appears more successful in satiating demand for visible policing, making useful contribution to alleviation of community fear by reducing the reassurance gap. In this sense, it is essential to question the key performance measures and success factors for community policing and community police officers. Ensuring wide-spread public awareness of and engagement with community policing is also important. There is a danger of assuming that ‘marketing and communications’ will suffice through forums and community leaders. Opportunities should be sought constantly to reinforce the importance of community policing within community consciousness. Success stories should be celebrated and publicised, but it is equally important that failures, missed targets and lessons learned be fed into a well governed continuous improvement process. This in itself may provide engagement opportunities and channels for new community stakeholders and act as a healthy challenge to police orthodoxy and culture (Neyroud and Beckley, 2008, pp. 215-220). Although community policing operates locally, ideally with extensive delegated authority, it is important that it connect into regional, national and even transnational policing initiatives. As an example, Project Griffin is “a counter-terrorism awareness” initiative (National Counter Terrorism Security Office, 2016) which evolved from a London centric pilot into a national scheme. Business community engagement through PREVENT, Project Griffin and other programmes help connects local community safety into overarching national initiatives. This helps build national resilience and strategic coherence. As community policing is a model ‘exported’ to other countries, there are also opportunities for police personnel to help shape, tailor and embed community policing outside of the UK. Notwithstanding the critical success factors for community policing previously outlined, this provides opportunities for officers to develop their professional skills and experience. Working with nations that have sizeable diasporas in the UK could be highly beneficial, in terms of improving each other’s policing methods (Groenewald and Peake, 2004) and cultural understanding. Community policing demands an operating context in which there is high potential to build trust relations between communities, the police and other public institutions. Fundamentally, community policing must be adopted strategically, implying institutional, structural and cultural commitment to its delivery throughout the policing model. 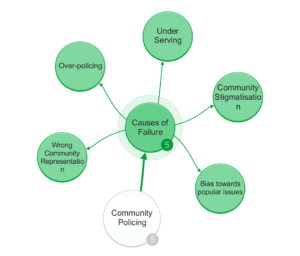 Failures can be attributed to unclear vision, managerialism, short-termism, and a lack of commitment to focus police resources on community led problem solving. The role of community policing in counter-terrorism is both increasingly important and scrutinised (Briggs, 2010). In safeguarding terms this relates to elicitation of intelligence, interdicting radicalisation, and protecting vulnerable communities from hate crimes and hate incidents (Loftus, 2012, p. 61) (likely to spike in the aftermath of terrorist outrages). 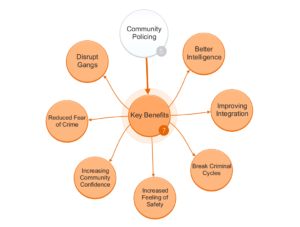 As a means of amplifying community reassurance, community policing has a role in the alleviation of fear and improving perceptions of community safety. Causative links between increased community policing and crime rate reduction seems weak (Myhill, 2003, p. 4). This should not be interpreted over-pessimistically. Reducing fear of crime and increasing public perception of the police is likely to both increase a community’s sense of self-worth and confidence. Community policing alongside approaches such as Problem Oriented Policing and Intelligence led Policing is a force-multiplier. The role of community policing in promulgating concepts such as ‘shared values’ and challenging ‘extremist views’ presents challenges. Dissent in faith-oriented and other social and morally conservative contexts may have legitimacy. Community policing is not therefore a vehicle for delivering intellectual and moral conformity, yet it must remain courageous in challenging stereotypes and isolating dangerous extremist and radical dogma. We really hope you found our article on Community Policing useful and enjoyable. Alderson, J. (1979) Policing freedom: A Commentary on the Dilemmas of Policing in Western Democracies. Macdonald and Evans. Blake, C., Sheldon, B., Strzelecki, R. and Williams, P. (2012) Policing Terrorism. Edited by P. A. J. Waddington and M. Wright. Sage/Learning Matters. Briggs, R. (2010) ‘Community engagement for counterterrorism : lessons from the United Kingdom’, International Affairs (Royal Institute of International Affairs 1944-), 86(4), pp. 971–981. Fielding, N. G. (2005) ‘Concepts and Theory in Community Policing’, The Howard Journal of Criminal Justice, 44(5), pp. 460–472. doi: 10.1111/j.1468-2311.2005.00391.x. Groenewald, H. and Peake, G. (2004) Police Reform through Community-Based Policing: Philosophy and Guidelines for Implementation, Security Development Nexus Program. HM Government (2011) CONTEST: The United Kingdom’s Strategy for Countering Terrorism. Available at: https://www.gov.uk/government/uploads/system/uploads/attachment_data/file/97995/strategy-contest.pdf. HM Government (2015) Channel Duty Guidance Protecting vulnerable people from being drawn into terrorism – Statutory guidance for Channel panel members and partners of local panels. Available at: https://www.gov.uk/government/uploads/system/uploads/attachment_data/file/425189/Channel_Duty_Guidance_April_2015.pdf. Independent Police Commission (2013) ‘Policing for a better Britain: Report of the Independent Police Commission’, p. 226. Available at: http://independentpolicecommission.org.uk/uploads/37d80308-be23-9684-054d-e4958bb9d518.pdf. Klockars, C. B. (2005) ‘The Rhetoric of Community Policing’, in Newburn, T. (ed.) Policing: Key Readings. Routledge, pp. 449–451. Mackenzie, S. and Henry, A. (2009) Community Policing: a Review of the Evidence, Scottish Government Social Research. doi: 10.1016/B978-0-12-373580-5.50043-0. Murray, J. (2005) ‘Policing Terrorism: A Threat to Community Policing or Just a Shift in Priorities?’, Police Practice and Research, 6(4), pp. 347–361. doi: 10.1080/15614260500293986. Myhill, A. (2003) ‘Community engagement in policing Lessons from the literature’, HMG, Home Office, pp. 2–70. National Counter Terrorism Security Office (2016) Project Griffin. Available at: https://www.gov.uk/government/publications/project-griffin/project-griffin. Office for National Statistics (2017) ‘Crime in England and Wales: year ending June 2017’, pp. 1–60. Available at: https://www.ons.gov.uk/peoplepopulationandcommunity/crimeandjustice/datasets/crimeinenglandandwalesappendixtables. Organization for Security and Co-operation in Europe (2014) ‘Preventing Terrorism and Countering Violent Extremism and Radicalization that Lead to Terrorism: A Community-Policing Approach’, p. 200. Parsons, T. (2017) Community Policing Responses to Violent Extremism Leading to Terrorism Module Booklet. London. Skogan, W. G. and Hartnett, S. M. (2000) Community Policing, Chicago Style (Studies in Crime and Public Policy). New York: Oxford University Press. Trojanowicz, R. C. and Bucqueroux, B. (1994) Community policing: How to get Started. Anderson Pub. Co.
Tuffin, R., Morris, J. and Poole, A. (2007) ‘An evaluation of the Impact of the National Reassurance Policing Programme, Home Office Research Study 296’, Policing: An International Journal of Police Strategies & Management, pp. 149–160. doi: 10.1093/police/pam024. Williams, E. J. (2003) ‘Structuring in community policing: Institutionalizing innovative change’, Police Practice and Research, 4(2), pp. 119–129. doi: 10.1080/15614260308021.